Everything is ok, especially the example data are prepared very well, so you can play with sentiment analysis within 20 lines. But most of time, in practical work, you should do more with the original data, like clean data, preprocess data with tokenize, lowercase and etc. So I have launched this series: Deep Learning Practice for NLP, which focus on learning by doing NLP with Deep Learning from scratch. 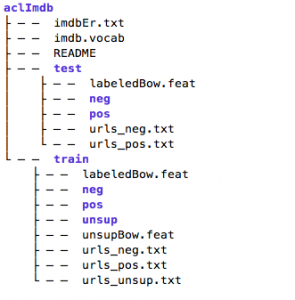 The first example came from the chapter 3.4: Classifying movie reviews-a binary classification example, which can be seen as a simple sentiment analysis task. First introduce the original movie review dataset aclIMDB: Large Movie Review Dataset, launched in 2011 by Stanford University Artificial Intelligence Lab, which contains 25,000 training data and 25,000 test data, and other 50,000 unlabeled data. The training set and the test set each contain 12,500 positive examples and 12,500 negative examples. For more detailed description of the data, you can refer to the official website of the data set: http://ai.stanford.edu/~amaas/data/sentiment/, paper: Learning Word Vectors for Sentiment Analysis, and readme in the dataset. After running this python script, an aclimdb.npz file will be generated in the data directory, which file structure is consistent with the official imdb.npz. 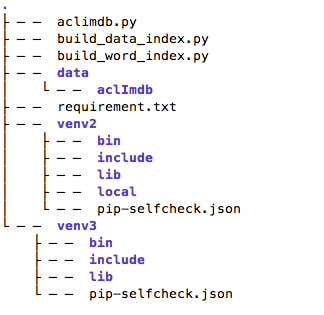 # Note the default index path is: "data/aclimdb_word_index.json"
More you can read and learn the book Deep Learning with Python, very good to recommended again.